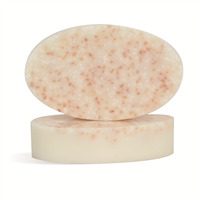 The Pink Himalayan Sea Salt in this melt and pour salt bar will leave your skin soft and smooth. You will want to use it every time you bathe or shower! To a microwave-safe measuring cup, add 14 oz. cut up Detergent Free Coconut Milk MP Soap. Heat in microwave until soap has completely melted. In plastic beaker, combine 14 ml Coconut Milk Fragrance Oil with 7 ml of Vanilla Color Stabilizer and stir. Set aside for 2 minutes then mix into the melted soap. To microwave-safe measuring cup, add 2 oz. of Coconut Soap Base and 0.30 oz. of Lotion Bar Additive. Heat in microwave for about 40 seconds or until lotion bar additive has completely melted. Add this into larger cup of melted soap and stir. Add 1.10 oz. Pink Sea Salts and 1.10 oz. Epsom Salts and stir well. Place Oval Guest Silicone Mold on a cookie sheet. Carefully pour the soap into 8 cavities being sure to stir the soap mixture before each pour to help keep the salts blended. Let sit at room temperature for about 10 minutes then place in freezer for about 30 minutes to set up. Remove from soap mold and set aside. Repeat above steps to make second set of soaps. Package suggestion: Place 2 bars in a cello bag and tie with matching ribbon or raffia. Ingredient Label: Sorbitol, Sodium Cocoate, Propylene Glycol, Himalayan Sea Salt, Magnesium Sulfate, Sodium Stearate, Glycerin, Coconut Milk, Titanium Dioxide, Polyglycerol-3 Beeswax, Fragrance. "I would like to add other butters to my soaps like cocoa butter and/or mango butter. Can I do this with the shea butter or coconut MP base? If so so how, much should I use?" Staff Answer We do not recommend adding additional oils and butters to the soap bases as it will cut down on the lather the soap creates. "I don't have smooth and creamy lotion bar additive, can I delete this item or are there other items I can use." Staff Answer Because the salt makes the soap very soft, you need something to harden it so it does not melt in your soap dish. If you do not have the Lotion Bar Additive, you could try adding beeswax. You may need to test the amount as the Lotion Bar Additive is a blend not just straight beeswax. "Can stearic acid be added to make the bar harder? And can the detergent free goats milk base be substituted for this recipe?" Staff Answer Stearic Acid does not make the detergent free soaps harder. This only works with the regular soap bases that have added detergent. For the detergent free bases, we recommend adding kaolin clay to the melted soap to help make it harder. And, yes, you can substitute the goats milk for the coconut milk base. "I've heard that the salt draws in moisture when used with Melt and Pour and makes the soap ''sweat''. Is there something in this recipe that counteracts that? or at least slows that process? Thank you." Staff Answer The Smooth & Creamy Lotion Bar Additive helps keep the soap harder and less likely to melt as quickly. "I'm considering returning to MP soap making after years of absence and want to make soap scrub bars, thinking of trying the Buttermilk or Shea MP Base first, I assume either would work in this recipe. Which of your other MP bases are harder bases, as I see you say the Coconut MP base is soft therefore using the lotion bar additive corrects that. I personally can't justify that amount of money on an additive when using a harder base would work. Thank you!" Staff Answer We specifically wanted to use a Detergent Free Soap Base for this recipe. You can certainly test the Premium Soap Bases instead of the Detergent Free to see how it performs in this recipe. "What benefit does the lotion bar additive add to this soap? Is it making it harder? I'd like to try the recipe but don't have that ingredient. I would have never thought to use beeswax (or a of...) in an mp soap base. Curious to know why it's used. " Staff Answer This is added to make the bar harder. If adding only the salts to the MP soap base, it is very soft and mushy and will melt quickly. 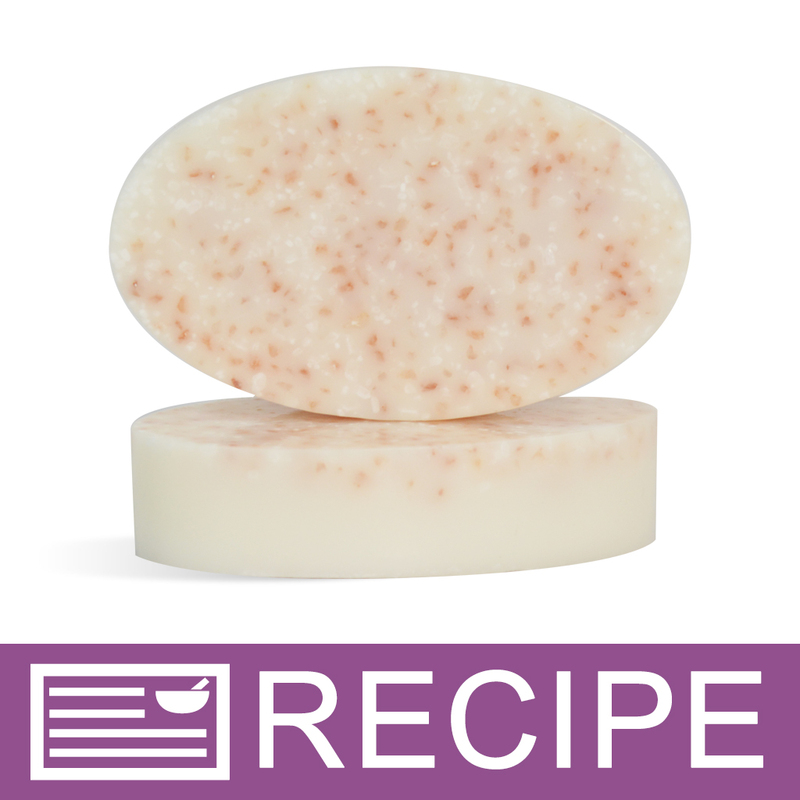 "In the kit, on this page, http://www.wholesalesuppliesplus.com/products/himalayan-salt-bars-MP-soap-kit.aspx, the Smooth & Creamy Lotion Bar Additive is listed at 2 oz. On this page, for the same kit, http://www.wholesalesuppliesplus.com/education/recipes/himalayan-salt-bars-melt-and-pour.aspx, in the ingredient area, it's listed at 0.6 oz, and 0.3 oz in the directions area. Can you please tell me what the correct amount should be?" Staff Answer The kit states 2 oz. because that is the smallest amount we sell to put into the kit. The directions are meant to be repeated. For the first batch of soaps, you add 0.3 oz. and then it is repeated for the second batch so the total amount needed is 0.6 oz. of the Smooth & Creamy Lotion Bar Additive. "What does epsom salt do for the soap? I never heard of this. Will it make the soap dissolve quicker? Thank you. " Staff Answer The epsom salts are added as an additional skin softener for this soap. MP soap does tend to dissolve quicker than CP so we always recommend using a slotted soap dish to keep the soap dry between uses. "Why vanilla stabilizer when there is no vanilla in the recipe?" Staff Answer We use the stabilizer because the Coconut Milk Fragrance Oil contains 4% vanilla. We recommend using Vanilla Color Stabilizer for any vanilla content in a fragrance.